Congratulations to the Regional Honorees in the Scholastic Writing Awards! Winners, listed on our website, will receive their awards at our ceremony on April 11th. Enter the 2015 Scholastic Art & Writing Awards by December 17th! This is Billy Gerchick, a Phoenix-area English teacher and Young Authors of Arizona (YAA) President, writing to share brief details about the Scholastic Art & Writing Awards and YAA, a non-profit and the statewide Awards sponsor. As described below, the Awards also empowers you to enter your uncensored work in the Awards with dynamic recognition, exhibition, publication, and scholarship incentives. The Scholastic Art & Writing Awards offers you an annual competition that respects your independence and incentivizes you to embrace all stages of authorship. Above: Students at the Awards’ annual national ceremony, held at Carnegie Hall. Among the students onstage, Scottsdale’s Haley Lee won a $10,000 college scholarship for her writing portfolio submission. Since 1923, the Scholastic Art & Writing Awards have recognized our nation’s exceptional youth, providing an annual opportunity for teens to be noticed for their creative talents. Today, grade 7- 12 students can apply in 28 categories of art & writing to earn scholarships and have their works exhibited or published. 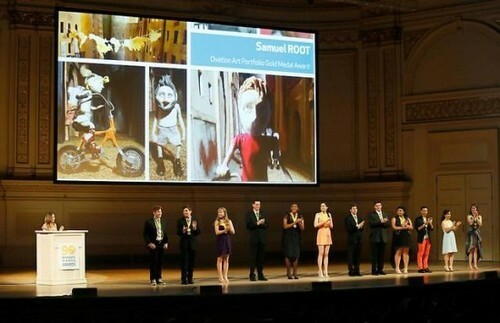 In the last five years, students submitted nearly 900,000 original works and during that time, over 60 arts institutes and colleges have sponsored the Awards to make $40 million in scholarships and aid available to Awards winners. Since 2012, Young Authors of Arizona (YAA) has sponsored the Scholastic Writing Awards in Arizona, raising over $10,000 in scholarships and helping 20 teens earn invites to the National Ceremony at Carnegie Hall. YAA now also sponsors the Scholastic Art Awards. Created by teachers, we’re here to help you encourage art & writing for Arizona’s youths. How? Each of the Awards’ writing categories—persuasion, personal narrative/memoir, journalism, poetry, flash fiction, short stories, science fiction/fantasy, scriptwriting, humor, portfolio writing, novel writing—offers unique participation and revision incentives for exemplary work created from January of 2014 – this December 17th. Each of the Awards’ art categories—architecture, ceramics & glass, comic art, design, digital art, drawing, fashion, film & animation, jewelry, mixed media, painting, photography, printmaking, sculpture, art portfolio—also offers unique participation and revision incentives. To get started, register your 2015 Scholastic Art & Writing Awards student account (even if you created one last year). YAA assembled the following digital resources to help you participate in the 2014 Scholastic Writing Awards between now and December 17th. 1. To register your student account, go to: artandwriting.org/ors/registration. 2. For Arizona’s Writing Awards rules & updates, go to YAA’s Scholastic Writing Awards page: artandwriting.org/affiliate/AZ001W. 3. For Arizona’s Art Awards rules & updates, go to YAA’s Scholastic Art Awards page: artandwriting.org/Affiliate/AZ001A. 4. For YAA news, go to YAArizona.org and subscribe to email updates. 5. Follow YAA on Tumblr. 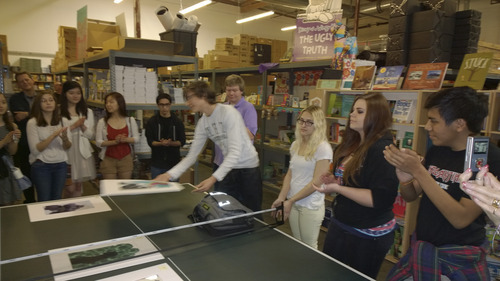 Above: Grade 7-12 Arizona authors meet in March of 2014 at Phoenix Book Company to select the cover art and co-author the back cover of YAA’s Best Arizona Teen Writing of 2014. Mentors were also invited to the event. Last spring YAA localized the Alliance for Young Artists & Writers’ annual Best Teen Writing book concept, a collection of the nation’s best grade 7-12 writing. 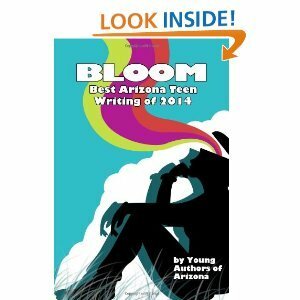 YAA did this by selecting from 2014 Gold Key and Silver Key Awards honorees works to create the first Best Of teen anthology in state history: Bloom: Best Arizona Teen Writing of 2014 . As noted by Arizona Republic columnist E.J. Montini in his column “OMG – these Arizona kids can write,” the efforts of these 64 teens have earned them the distinction of “published authors,” including the cover artist. Above: Cover to YAA’s Bloom: Best Arizona Teen Writing of 2014. More important than what’s already published, I’m asking your help to facilitate grade 7-12 peer participation in the 2015 Scholastic Art & Writing Awards by December 17, 2014. What work between now andDecember 17th can earn you publication in YAA’s Best Arizona Teen Art & Writing of 2015 publications, in Arizona libraries, and online at YAArizona.org? The Best Arizona Teen Art & Writing book gives students the chance to earn space as a published author between now and December 17th. From Arizona’s 2015 Awards Gold Key and Silver Key entries, this year’s YAA judges will select dynamic works from each category in early February. All five American Voices nominees will be guaranteed publication in the book. Get to meet fellow published young authors, review your work, and co-author the “best of” back cover at Phoenix Book Company on Saturday, March 14th. After the book is “sent to press,” the authors’ family members, mentor teachers, and authors will celebrate the authors’ accomplishments and enjoy a cornucopia of desserts. In the spirit of positive recognition, each of YAA’s 2015 Scholastic Awards Gold Key, Silver Key, and Honorable Mention submissions will be invited for digital publication on YAA’s Scholastic Art & Writing Awards affiliate pages and on YAArizona.org. For help as mentor or with ideas how YAA can help your campus, club, or organization, please fill out the YAA Involvement survey or e-mail one of the two below addresses. Young artists at Central High School, Coronado, New School for Arts and Academics, Alhambra High School, Desert Mountain High School, and South Mountain High School: you have the opportunity to learn from cutting-edge contemporary artists and exhibit your work at the Scottsdale Center for the Performing Arts! Through the Visions program at the Scottsdale Museum of Contemporary Art, visual arts teachers at the six participating schools may select a group of 40 students to take part in a year-long program of workshops, lectures, and discussions that will culminate in a summer exhibit at SCPA’s Young@Art Gallery. I’d highly recommend that you speak to your teachers about this if you are interested; it sounds like a brilliant opportunity to learn and showcase your work. While my school doesn’t participate in this program, I’m thrilled to know it exists. I knew SMoCA was a really cool institution (after seeing their exhibits, who doesn’t?) but now I have something new to admire: their commitment to the education of young Arizona artists! When I write prose, I don’t often write about myself; when I do, it’s as context for a broader topic. I’m afraid of confessional writing that curdles into navel-gazing, and in personal essays–because they require me to contextualize my emotions with experiences–that trap is difficult to escape. For a long time, this fear has led me to hold a barrier between myself and the reader. It’s never obscured the truth or core of my writing, but it has shielded me from true vulnerability. Maybe that vulnerability is not always necessary, but it’s something that I crave–and I think I know why. In a 2008 interview with Identity Theory, Junot Diaz addressed this very idea: “You can’t find intimacy–you can’t find home–when you’re always hiding behind masks. Intimacy requires a certain level of vulnerability. It requires a certain level of you exposing your fragmented, contradictory self to someone else.” And isn’t intimacy an integral part of our instinct to write? Jamison’s fixation with honesty, too, reflects that craving. As she wrote in her column, her desire to present herself at her most base was really a desire to be fully connected with her audience, so connected that they would know her at her worst. We assume, often, that our most private and essential selves are also our darkest. Yet when I think of the people I have a deeper understanding of, it’s not their worst qualities that come to mind. Instead, it’s the hidden virtues. The little things to admire. The greater landscape of character that makes it easy to forgive their flaws. How do you approach honesty in your writing? And what old habits are you seeking to change? The creative process requires an author to balance between the parameters that give their work definition, and the freedom that gives their work spirit. As young authors, we sometimes find ourselves sticking too closely to our comfort zone, or spiraling wildly out of it–and neither approach produces our best work. Recently, I’ve caught myself sticking to a constant form, regardless of what best suits a piece. To combat this, I made up an exercise in which I force myself to follow a set form that differs from my norm. I do my best to express what I want to within the form I’m uncomfortable with. When I’ve gotten as far as I can with that, I start playing around with that structure, shifting it around until it says what I want it to. I’ve also found myself shying away from the topics that are most meaningful to me, but it’s difficult to force myself to write about things I’m so afraid of mistreating, and I don’t think it’s necessarily healthy. I’m trying to write about topics tangential to these, slowly working my way to those tender spots. So, a question to think about: in what ways do you restrict your own work? What methods have you tried to break out of those habits?